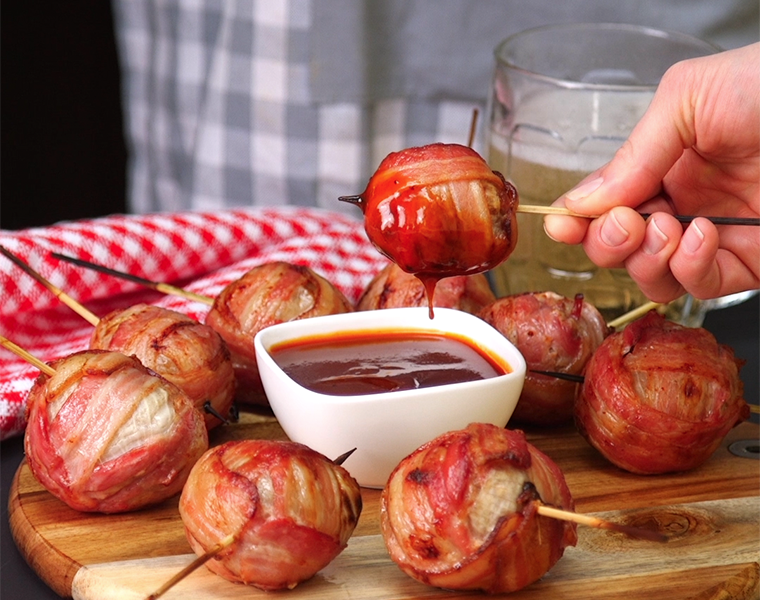 Onion Bombs look small, but they are jam-packed with flavor and are surprisingly filling. With a meatball inside, sweet onion outside, and it all wrapped in bacon, this recipe hits all the marks as a delicious appetizer or main course. You can try throwing these on the grill on medium-low heat, or simply stick ’em in the oven while you prep anything else you want. Baked potato or salad would be a perfect pairing, but these can also easily stand alone. Serve these stuffed bombs in BBQ sauce or ketchup and get dipping! In a large bowl, combine the ground beef, crumbs, egg, milk, ½ cup BBQ, onion, salt, pepper and garlic powder. Mix together with your hands until thoroughly combined. Stuff your meatball mix between two Onion Layers (essentially making an onion seal around a large meatball). Bake in a dish with sides (to catch grease) at 425 for approx 40 minutes or until internal temp 165.